The Renault Kwid and the Fiat Panda Cross. The same idea, the same segment in different markets and targets. The Kwid will be priced starting at 4.000 euros vs. 20.000 euros for the Panda Cross. They can be considered the embryos of a new segment. The well-known (in Europe) 4×4 off-road version of the Fiat Panda, named Cross, and the recently presented Renault Kwid could become the pioneers of the still to come A-SUV or City-SUV segment. Although they are both based on standard passenger cars and they’re included in the A-Segment (at least in the case of the Panda), the idea of having small SUVs, shorter than the B-SUVs is becoming more a fact. Jeep brand has already warned that it could manufacture a small SUV, right below the Renegade. Smart, Daimler’s city-car brand, is already preparing a SUV/Crossover look version of its Forfour. In Japan, the land of the Kei-cars, Suzuki and Daihatsu already offer their city-SUVs. It’s just a matter of time till we see this new segment rise, and Fiat and Renault could be ahead of the competitors with 2 products with different targets and perspectives. Fiat should pay attention. 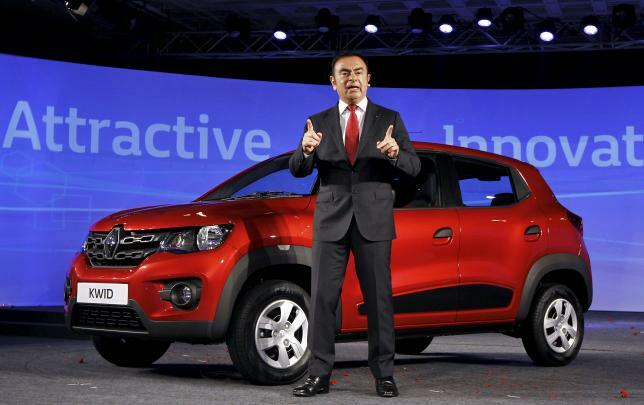 The new Renault was created with the Indian car market in mind and according to Renault-Nissan’s CEO, Carlos Ghosn, it will be the base for new Renault-Nissan vehicles in India, South Africa and South America. The Renault Kwid is a 3,68m length SUV-style city-car designed and produced in India that will be priced at only 4.000 euro to get a big part of the giant Indian A-Segment and the increasing SUV segment sales. The Kwid will contribute to the brand’s sales target as it aims to boost its market share to 5% by the end of 2016 from 1,78% last year. By that year Renault is expected to have 280 sales outlets from the current 157 (Suzuki has 1500 exhibition rooms). The Kwid is no more than a tall city-car but the brand wants to position it as a city-SUV thanks to its cross-over look, high ground clearance, high seating position and short front and rear overhangs (it is taller than the regular passenger city-cars), as its engines and transmission (4WD is not even planned) are exactly the same of other cars of the group. However Renault-Nissan can now offer a very small and robust city-car that can be perfectly sold as a A-SUV with a very competitive price. Fiat has the Panda Cross. It is only available in Europe, and features the technology of a real SUV, with a 4WD transmission, fuel-efficient engines and a comfortable interior. Compared to the regular version, the Cross is taller, has a higher ground clearance and features some plastics and headlights that give it a cross-over look. But all of this is not for free: the Cross is priced at 20.000 euros, or 5 times more than the Kwid. 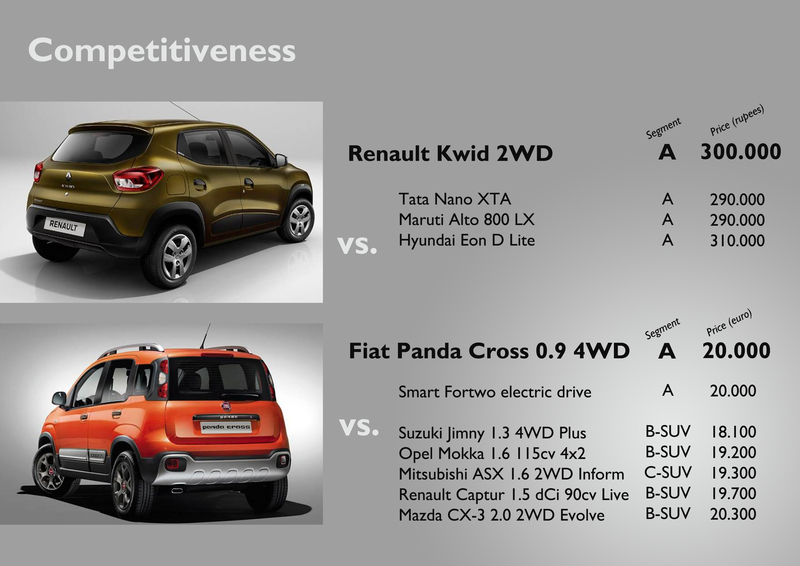 It is not clear how high or low its demand is, but based on these specifications and its price, the Panda Cross can’t be the game changer that the Kwid is expected to become for Renault in India. Of course they’re playing in 2 completely different markets where labor, tax, safety and emissions regulations differ. But Fiat is strong building city-cars and it could have a better position in India if it projected the cars like the Panda in a global way. The Cross is a good idea, but there are 2 things the brand should consider: Fiat should make use of this city-SUV to create the segment in Europe by launching more affordable versions and maybe a new nameplate that differentiates it from the popular city-car; at the same time European market isn’t enough and Fiat should think of a global A-SUV that could easily work in Europe, India, South East Asia and Latin America. If Renault could do it, why not Fiat? The Kwid is a good example. Cost of r&d, suppliers, manufacturing etc would be vital. i.e., the car could only be made in either Brazil and/or India, even Serbia and Turkey would be too expensive imo. The 2015 Brazilian Nuvo Uno Sporting? The FCA head of international product planning was recently quoted by a major Australian auto internet magazine as saying that they were looking at replacing the Panda Cross 4×4 with Fiat-Jeep twins, esp for emrging markets, and for which a country like India would be the ideal manufacturing location. There’s surely a market for such vehicles, adapted, in Europe too? It’ll surely need to be bigger than both the Panda and the Kwid, which btw is a very low spec car, when it comes to safety, build quality, chassis rigidity, tyres, nvh etc. With a very weedy, tiny engine too. This is my second post and in first post also I mentioned fiat should bring The Panda to India, But of course not in the price range of 20000 euros. 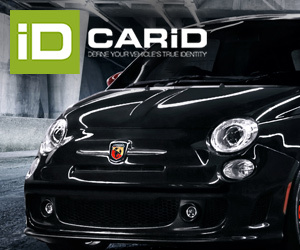 The biggest problem for Fiat in India is that, Fiat is always late in bringing something new…. be it 1.3 multijet engine(Suzuki brought that to India way before Fiat), or 7 seatter car or a car model in the range of 3,00,000 Rs. (4000 euros). (Not sure if last two will ever be launched in India). Since fiat doesn’t have wide range to offer, their numbers in sales chart are always decreasing.. Which is disappointing.